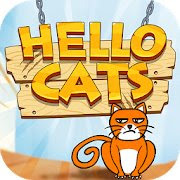 Hello Cats by Fastone Games walkthrough, solutions, cheats all levels, for android, iphone, ipad and ipod. Sometimes cats will make trouble and hide themselves. To catch the naughty cats, draw an adequate shape then tactfully use the terrain and featured objects within the puzzle level. You’ll find more interesting devices and also earn massive reward as progress of puzzle levels. If you can't figure out how to solve a level in Hello Cats, just select that level from the list below and you will see a screenshot with the solution for that level. If the level is not the same for you just leave a comment and we'll update the walkthrough a.s.a.p. Important: All levels were updated, make sure you have the latest version of Hello Cats!! !